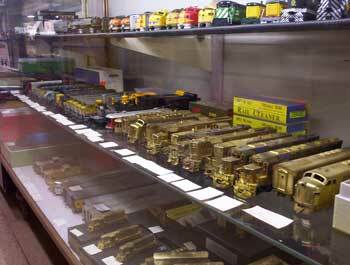 Scale Model Supplies sells brass trains ON CONSIGNMENT only. Most are HO scale but other scales sometimes come in. Our inventory can fluctuate from day-to-day, so contact us or call us for information on what we have in stock. Detail Associates, Details West, Cal Scale, Precision Scale, and many others. After World War II, American GI train buffs stationed in Japan could not help but notice the high quality of the brass model trains being produced by local craftsman. Some of these GIs got to know the locals, sharing photos of their favorite hometown trains. Before long, these Japanese craftsmen were producing small-run or even one-of-a-kind brass trains for a new crop of American customers. These early brass model trains, which today can bring tens of thousands of dollars at auction, were extraordinarily accurate and precise. They were completely hand-made, right down to individually hand-punched rivets. And they ran like a dream. Most of the postwar brass trains were made in Japan in the HO scale—only relatively recently has the field been taken over by manufacturers in South Korea, although fully 80 percent of all brass model trains are still scaled to HO. But one thing about brass models trains has not changed: the very small size of the editions. Even today, it is not uncommon for a train to be made in batches of 150 or less. In post-war Japan, the edition sizes were frequently as small as a handful. Importers like Max Gray, Pacific Fast Mail, and Westside Model Company brought brass trains made by Fujiyama, Nakamura, Tenshodo, Toby, and United to American shores. These trains from the late 1940s through the 1960s are some of the most collectible examples around. While many collectors find it useful or just plain interesting to know the name of the manufacturer that made a particular brass model train, most choose trains for their collections based on the road, or train company name that they are collecting. So, for example, if you grew up on the East Coast, you may specialize in New York Central trains. Collectors in the Southwest often collect trains emblazoned with the words "Santa Fe." Indeed, thanks to the small runs of brass trains, which means a manufacturer need only sell 100 or so of a particular model, the so-called short-run lines that were too tiny to be marketable for Lionel and other big model-train makers were well represented in the brass train world. Originally, brass trains were not painted. Except for nickel plating used on grills, wheels, and other accent parts, the trains were left brass-colored. Eventually, though, customers began demanding graphic realism as well as three-dimensional accuracy. Thus, a Great Northern Railway steam locomotive made by United in 1957 might be painted in graphite and black, with weathering, water stains, and even rust marks painted on its sides to give the model added impact. The majority of brass model trains continued to be made in Japan until the 1970s, when production shifted to Korea. The first of these models, from about 1974 until 1980 or so, were poorly made, as a new generation of manufacturers learned the secrets of this arcane trade. Korean trains improved until about 1986 when the Second Golden Age of Brass, as some are calling it, blossomed. 1) Detail quality–-This is really what you are paying for in a brass locomotive. Instead of molded piping and other appliances, a brass locomotive will have wire used for piping and small brass detail parts soldered on. Really old brass locomotives (made before 1960) may not have the quality of detail of the newer brass locomotives. 2) Sprung drivers–-This is a sign of a higher-quality drive mechanism. A locomotive with sprung drivers will operate better over slight variations in trackwork. 3) Closed gearbox drive--Older models sometimes used open gears on the drive axles. Look under the locomotive to see if it has higher-quality enclosed gearing or older open gearing. If you buy a brass locomotive with open gearing, you would not expect to pay as much for one with closed gearing. 4) Quality of paint--Some people prefer unpainted brass. Others prefer "factory paint". Some custom paint jobs can be better than factory paint. Some custom paint jobs will make you want to strip the locomotive and start over. It's a personal preference. 5) Original box--Sometimes having the original box that a locomotive came in increases its value. This may not be important to everyone, however, some collectors store their locomotives in boxes, which makes having the original box more desirable. 6) Can motor--A can motor is not all that important to someone who has the ability to re-motor a locomotive. Some collectors will replace an open-frame motor with a can motor and flywheel. And a can motor provides the ability to add a flywheel which is just as (if not more) important as the motor.